The breed derives its name from the French word Bichon which means, “small, long-haired dog.” The Bichon Frise is a descendant of the Water Spaniel. They were popular with Spanish sailors in the olden days and used on their boats. The Sailors would also use them as barter, and that’s how they reached different continents. The breed quickly became a great favorite of the nobility. King Henry III was so fond of his Bichons that he carried them in a little basket that hung from his neck. However, the little dog fell from favor with the royalty in the 1800s and was often owned by organ grinders and circus performers. After World War I, French breeders became interested in the Bichon and worked to preserve the breed. The Bichon Frise is a cheerful dog and loves attention. They are naturally gentle, playful, and happy. They love you unconditionally, and the love you give them comes back a hundred fold. Bichons are a friendly breed with a charming personality. The breed is good with children as well as other dogs and pets. However, as with any dog, you must teach young children how to properly play with them to avoid unintentional injuries. They are moderately active and have a penchant for clowning around in a nondestructive way which makes them ideal for an apartment lifestyle and indoor living. Bichons usually weigh between 10 to 18 pounds and stand approximately 9 to 12 inches tall. This cotton-ball like dog has a small, compact frame and is surprisingly sturdy. This breed has a double coat with a velvety feel to it and must be brushed regularly to prevent matting. If its hair is left unbrushed and uncut, this dog looks a little scruffy. The color of the coat is white with slight shades of buff, cream or apricot. 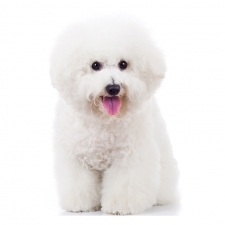 The Bichon Frise is the 16th most popular dog registered with America's Pet Registry Inc. Many designer dogs are derived from the Bichon since they are considered hypoallergenic. These little dogs are remarkably long-lived. Their average life span is 15 to 16 years and some even surpass 20 years.